On Dec. 31, after 10 years as Washington and Lee’s president, Ken Ruscio leaves office. Before he was president, he was, of course, a professor of politics, associate dean of the Williams School, and dean of freshmen, from 1987 to 2002. Before that, he was a student, from 1972 to 1976. The W&L community recently honored the Ruscios and their legacy in the video above, featuring excerpts from many of Ken’s speeches over the years. Earlier this fall, President Ruscio sat down with us in his Washington Hall office for a conversation, which appeared in the fall issue of W&L: The Washington and Lee Alumni Magazine. Q: In a 2011 Q&A for this magazine, you said you take seriously the leadership principle that we are all obligated to leave things better than we found them. You are leaving W&L a better place. Of what are you the most proud? Being able to change while also respecting history and tradition is very important for an institution like Washington and Lee, so with all that we have been able to accomplish, I think we’ve also held very true to our traditions and our history. And as I have said — on too many occasions, probably — in order to keep things the same, sometimes you have to make some changes. Preserving what matters sometimes means changing some things along the way. That seems contradictory and paradoxical, but Washington and Lee demonstrates the truth of that proposition. So if there’s something that I feel best about, it’s being able to remain true to the institution’s character even as we prepare ourselves for a very different kind of future. Q: These days in particular, colleges and universities must work to communicate the qualities that distinguish them from the rest of the pack. How has W&L distinguished itself while you’ve been president? We are not very good at self-promotion at Washington and Lee, and that’s one of the things that I like about the institution; we just do what we’re supposed to do. We don’t engage in constant navel-gazing about what makes us unique and what makes us distinctive. Having said that, we are a category of one. We are so unlike any other college. We have such a depth and breadth of curriculum, and such a unique relationship between professional and liberal arts educations, and also such a deep understanding that education goes beyond the formal classroom setting. We think about education in a comprehensive, broad way. During their time here, our students learn a great deal about themselves in their everyday interactions with faculty, staff and students. The combination of that breadth of experience, and at the same time a very intensive academic experience, happens at W&L unlike any other place I am familiar with. There is an institutional ethos here that is hard to adequately explain or articulate, but it is real and shapes the lives of our graduates in ways they don’t fully appreciate until they get some distance from the university. that needed to be made at W&L? This university is both a left brain and a right brain university. We have an intuitive understanding of the culture that is not quantifiable. But we are also very good at using information and data, keeping up with trends, and understanding the external environment in which we find ourselves. For example, with the capital campaign, which ended last year, Dennis Cross (vice president for advancement) and his staff exceptionally used extensive research to assess the institution’s potential to raise funds. 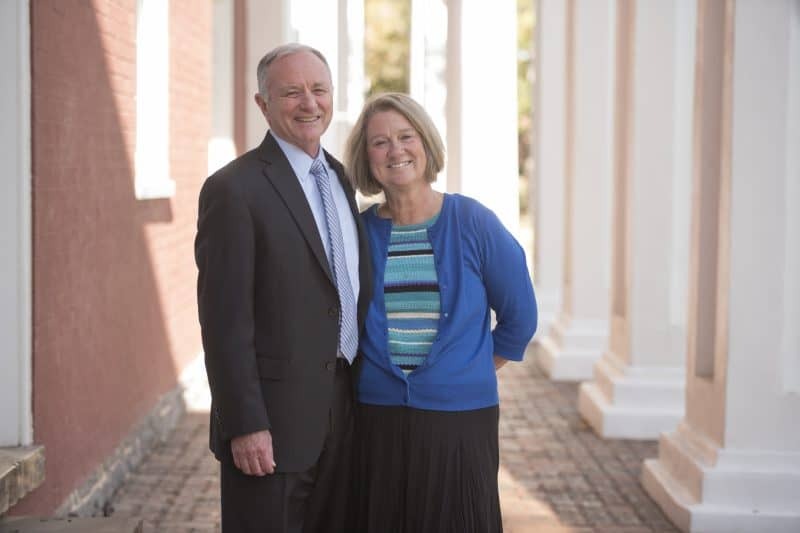 But at the same time, they knew that for any W&L capital campaign to be successful, it would have to be based on relationships and commitments of individuals who cared about the university. That was a great example of the use of information, the use of data, an understanding of our alumni base, but it was combined with an understanding that success requires more than data. There are many other instances of that. You look at how Steve McAllister (vice president for administration and treasurer) has managed our finances. A lot of analysis goes into projecting our revenues and expenditures, managing our endowment, and making specific decisions such as whether we could develop additional campus housing. Over in the admissions area, we are increasingly aware of demographic changes in the population, and how we can best communicate with 18-year-olds who acquire their information differently than prospective students did 30, 20 or even 10 years ago. Q: In your conversations with alumni, you hear so many examples of how W&L has made a difference in their lives. Can you share one of your favorite success stories? It’s very hard, because I can think of so many alumni Washington and Lee can be so very proud of. Surely one of the most recent ones is Mike Missal ’78, who was confirmed in April as inspector general of the Department of Veterans Affairs. It came at a stage in his life where he could kick back and just enjoy things, but he decided to take on one of the nation’s most challenging problems at the moment: the treatment of veterans. And he did it out of a real ethic of service, of duty, of obligation — for all the reasons that we hope our students take from here. He took on a challenge that most of us would have run from in a heartbeat. So I think of him, but frankly, mostly because he is the most recent example, and I spoke with him just the other day. Call me tomorrow, and I will probably have just been thinking about another alum who is doing something incredible, maybe one of our graduates conducting medical research, like Dr. Erika Proko Hamilton ’03. This summer she became the director of the breast and gynecologic cancer research program at the Sarah Cannon Research Institute, in Tennessee, and she is a member of our Athletic Hall of Fame for her admirable career here as a student-athlete. Or call me the next day, and I may have just had the privilege to talk with one of our legendary public servants, such as Senator John Warner ’49, or Governor Linwood Holton ’44, or journalist Roger Mudd ’50, or philanthropists Gerry Lenfest ’53, ’55L and Rupert Johnson ’62, all of whom are alumni who love what they are doing or who have had careers based not on self-gratification but on the impacts that they have on others and on society. Q: What is the most valuable lesson you have learned at W&L, whether as a student, a professor or the president? Whenever I have made a decision about whether to take a job or not, it has always come down to whether I will be surrounded by good people. That consideration brought me to Washington and Lee in three different capacities — as a student, as a faculty member and now as president. I’ve learned that institutions that care about relationships and the quality of relationships are a good place to spend a career. Washington and Lee has the capacity to enhance and nurture relationships, and it’s across the board. It’s student-faculty relationships, of course, but it’s also staff and students, students and students, students and alumni, and faculty and alumni. There’s just something about Washington and Lee that leads to relationships of very high quality and very high character. So if I’ve learned one lesson — and it’s a lesson that I hope our students take away — it’s that as you go through life, look for settings and opportunities where relationships can develop, where you can be surrounded by good people, where you can learn from them, and where you can grow as an individual even as you feel a part of a close-knit, supportive community. Q: What is your hope for the future of our endowment? need to take care of. We can focus on the quality of the educational experience here, not our survival year to year. So endowment growth is critical for our success in the future. It makes the institution more stable, it makes our future less uncertain, and it puts so many things under our control. The sum of all of that means that we can indeed focus on quality and innovation in ways that other places can’t. Specifically, the capital campaign has enabled us to do three important things through the endowment. First, our financial aid has increased more than any other part of our budget, and we were able to do that not by putting pressure on tuition but rather by increasing endowment dedicated to that purpose. Another problem we addressed at the beginning of the strategic plan was a shortfall in faculty compensation. How do you improve faculty compensation, where we lagged far behind our peers, without putting pressure on tuition or without taking away from other priorities? By increasing endowment dedicated to supporting faculty. The third set of initiatives was the growth of innovative interdisciplinary programs. The Shepherd Poverty Program is now endowed, and the recently created Roger Mudd Center for Ethics (2010) and the J. Lawrence Connolly Center for Entrepreneurship (2013) are both supported through endowments. Those are among the most exciting and innovative academic developments of the last few years. Without support from an endowment, they would have been impossible to develop and sustain in the long run. Q: If you had to choose only one quality with which to imbue graduates of W&L, what would it be? So there is an awareness among our graduates of the needs and interests of others around them. We appropriately reference a number of virtues such as integrity, trust, honor, duty, obligation and respect for others. All of those matter greatly, but when you put them all together, living a life of consequence, of honor, is a rejection of self-interest, and instead a focus on the needs and interests of others. And Washington and Lee does have a way of making that almost instinctive in its graduates. Yes, there’s the Honor System. Yes, there is student self-governance. Yes, it’s the relatively small size of our community. All of those are means, though, to the end, which is to develop a commitment to something greater than the self. Q: You’ve made it clear over the years that you believe strongly in civilized debate. Do you think it is endangered? I do, I really do. It’s always been endangered to some degree. It’s in our human nature to simply spout off, to not think before you speak. And we go through these periods where, remarkably, speaking your mind is mistakenly equated to saying whatever is on your mind without reflection and without letting any kind of judgment or discernment serve as a filter. Well, there is something to be said for being candid and direct, but there is also a lot to be said for thinking before you shoot your mouth off. And it goes back to what I was saying before: If Washington and Lee teaches respect for others, then understand that some of that respect has to be respect for the opinions of others and the perspectives of others. It’s easy to be around people you agree with; it’s a lot harder to live in a community where people have different views and different opinions, but that’s life in a democracy. Civility is always a fragile virtue in society, but it’s important for places like Washington and Lee to remain committed to that during the tough times and to send the signals that educated, broad-minded people ought to practice the virtue of civility and respect the views of others. Q: The working group that you established to study the history of African-Americans at Washington and Lee continues to explore that history as race relations in America seem to be eroding. What advice would you give this group? Clearly we have thought so much about that, and in the broadest context imaginable. Washington and Lee is an institution with a long and rich history. It’s a complex history, and it is a history that reflects the arc of our country’s history. We were here before the founding, we were here during the founding. We were here during the Civil War, obviously; we were here in the aftermath of the Civil War. We were here during the civil rights era, when Washington and Lee integrated its student body. We rightly embrace the history of this institution in all of its complexity. In many ways, we are in a position here at Washington and Lee to lead the very difficult conversations about the nation’s history. Why not take advantage of that opportunity and tell our history in its fullest? We try to understand the history of our country and the history of our institution in order to become better, and the only way we are going to become better is to understand the difficult choices that people made in the past and how that is going to inform the difficult choices that we are going to make in the future. So if any institution ought to embrace the complexity of history, it ought to be Washington and Lee. So I would advise the working group to keep telling the story and learning the lessons from it. So many people have made contributions to this university in so many different ways, and when we look back at the contributions of African-Americans over time, those contributions have also come in so many different ways. What we have not looked at until this point are the contributions of those 84 enslaved Americans who were part of this institution from 1826 to 1857. They are part of our history, and that ought to be acknowledged, and their contributions ought to be acknowledged as well. Q: You’ve made some decisions during your tenure that some people considered controversial. How did you prepare yourself for potential backlash? When there are hard decisions to be made, you talk to as many people as possible, and you do as much research as possible. You really try to understand the issue and understand the perspectives of so many different people. But in the end, if you know you are going to get criticized no matter what you decide, that can be liberating. You might as well do what you think is right, and then you can at least live with yourself when it’s all over. That doesn’t make it easy when the criticism comes, because you know it’s coming from people who also care very much about the university. I don’t minimize the commitment that individuals have to the institution who may disagree with things that we’ve done. So I’m not saying that makes it easy, but I am saying it enables you to be confident in the decision that you’ve made, knowing that you are looking at the best interest of Washington and Lee. We don’t want to be an institution that’s frozen in time. We are an academic institution, not a museum. For an institution that is always going to be moving forward, always going to be engaging with hard decisions, always trying to improve itself, you can’t sit still. You have to be out there trying to determine how we can constantly make ourselves better. The answer is yes, sure, there are always things you would do differently if you knew then what you know now. If there is one frustration —and I don’t know how I would have fixed this — it’s that there just wasn’t enough time to spend with the people I wanted to be with and keep track of. At the end of every year, I would say to myself, “Gosh, I wish I had spent more time with the faculty and gotten to more of their events and presentations.” The next day, I’d say, “I wish I could have spent more time with the students.” Then I’d be headed off to an alumni trip, which I love to do, and I’d say, “I’d like more time for this.” So I wish I had been fully aware at the beginning of just how difficult it is to spread your time among all the people you really want to get to know. Q: During your tenure, the university has lost students, esteemed faculty members, former presidents. How did you stay strong for the community at those times? When Kim and I talked in 2006 about coming back to Washington and Lee, one of the things we understood was that it was entirely possible we would be here when some of the true legends of W&L would be leaving us. So many of them have had such an impact on the institution. As we have gone through those periods of loss, we have tried to use that time to remind ourselves of some of the fundamental values and principles that those individuals represent, and how those dedicated individuals have helped shape the university into what it is today. So those are sad times, but they are also times to reaffirm the fundamental underlying values of the institution those individuals personified. The loss of students is a very different matter, and there is just no way to ever anticipate that or be prepared for the impact that has on you as an individual or on the community. I am deeply aware of the feeling of loss that students have when one of their classmates has been taken from them tragically, and I’m also very much aware of the impact on the faculty and staff who knew that student. Because of the closeness of this community, any loss has a real and genuine effect on the place, and those are hard times to get through, to be sure. During those difficult times, I take some consolation and draw strength from seeing some of W&L’s finest qualities on display — the caring, mutual support that members of our community provide so naturally to each other. Q: What advice are you going to give your successor, Will Dudley? Well, the standard response to that is, that will be between me and Will Dudley [laughs]. We are very, very fortunate to have someone of his experience and background and understanding of Washington and Lee to lead the university, at this time of challenge, but also a time of great opportunity. He is going to be a wonderful president, and he already has made connections and shows a deep understanding of the institution. I think I am going to have my advice be between us, in part because he is not going to need advice from me. He is going to be fine. Q: In what ways have your wife, Kim, and your son, Matthew, helped you do your job? You can’t do it without support. Kim has come to know Washington and Lee and come to love and understand this place as much as anybody. In those moments when I needed somebody to say, “Get over yourself,” she has never failed to deliver that kind of message. And of course through her own involvement in campus life, she has helped set the tone and spirit during our time here. It has not escaped my notice that I don’t hear too many people telling me that I’ll be missed, while hearing many, many people say they will miss Kim. Matthew has also helped me keep things real. He went through his college years while I was a college president, so some afternoons I would go from delivering messages to W&L parents about how to work with sons and daughters during this important time in their lives, to getting in the car and driving up to his college to be a parent. And he would remind me to take the advice that I so easily dished out to the parents of Washington and Lee students. Seeing him make his college decision while I was a college president, then go through the four years as a student (and student-athlete), and then graduate and embark on his career, was a constant reminder that the students at Washington and Lee are young men and women going through the real ups and downs of college life. I would see it every day in my own family. So the two of them played a lot of roles, but probably the most important role was to keep me grounded, and not to always be thinking of myself as the college president, but as a father and a husband at the same time. Q: What has been your favorite part of living in Lee House? We could write a whole different article about living in Lee House. Kim and I have so enjoyed our time there. It’s an adjustment because it’s not the real world, you are right in the middle of everything. It’s a place where you live, and you have to make it your house, but you’re always aware that that so much of the history of the university has gone through those doors. And so many prominent individuals — not just the people who have lived there, like Robert E. Lee, but the people who have been there for dinner and receptions — have graced our campus. We keep track of the number of people who come through on an annual basis, and it’s typically anywhere from 5,500 to 6,000 people per year. That always surprises us because it doesn’t feel like crowds have gone through, it just seems like there is a lot of activity and a lot of events. It includes people who are coming back to campus for the first time in 50 years, as well as new students who have been on the campus for only two or three days and are seeing Lee House for the first time. Q: Is there any particular feature of Lee House that you wish you could take with you? You know, in truth, we probably spend more time in the kitchen than any other room. It’s where we go in and out, it’s where we converge at the end of the day or at the end of a meeting or a reception. It’s where Kim and I finally settle down at the end of the day, over dinner on those rare days when we have no late commitments. It’s where the public and the personal side of the house intersect, at least for Kim and me. I’m sure that’s not an answer that people would expect to hear, but it is a place where for us, as residents, we both rest at times and at other times prepare for the receptions, dinners and other events we hold at the house. I do remember my first night in Lee House. I hadn’t yet been installed as president, but I was preparing for the transition. I was visiting for a couple of days, and the Lee House was not occupied at the time. And I was determined that it was going to be just a matter-of-fact evening, nothing special, this is where I’m going to live for however long, so I’m just going to go to bed like I usually do and do a little reading before I nod off and go to sleep. I figured, I’ll get into the routine, nothing special. But I just couldn’t get to sleep. It wasn’t noise or anything like that, it was the realization that I was in the Lee House. Finally, about 1 or 2 a.m., I just got up and wandered around. [I was thinking] Robert E. Lee lived here, this is the room where his wife taught his daughters how to play the piano, this was Mrs. Lee’s bedroom, and this was Robert E. Lee’s bedroom, and this was the room in which he died, and you just realize that yes, this is a house, but it’s much more than a house. If you asked Kim that question, she’d probably have a very different answer. She has spent much more time with the décor in Lee House and making sure it was right for its character. One of her projects was restoring some historical integrity to the rooms. My job was to stay out of the way. Q: When you come back to visit Lexington, what spots are you most likely to visit? Gosh, we’ll have to make the rounds. When I talk to the alumni and new students — so people who are very familiar with the place and some who aren’t — I tell them that this is a place where the whole becomes much greater than the sum of the parts. For a new student, the footbridge to Wilson Field is just a cement structure that gets you from one place on campus to another. For someone who has been here longer, that becomes a kind of landmark that conjures up certain memories. The Colonnade is not just a bunch of bricks and columns and a nice front lawn, it’s a place where a lot of things have happened that are in your store of memories. So I don’t know that I’m going to have one place. I’m going to see the Colonnade and think of all kinds of things, I’m going to see Doremus Gym and think of a lot of things. I’m going to see the library and the Elrod Commons and think of a lot of things. I’m going to see the landmarks in town — the shops and the restaurants — and think of people I’ve seen there and stories we have. So it’ll never be one place, because this is a university where truly the whole becomes much greater than the sum of its parts. Colleges. What appeals to you about that job? It was not planned. This was the first time in my life where I stepped down from a job not knowing what I was going to do, but thinking that I wanted to finally get some time to write, to maybe go back and do some teaching, and I was very happy and prepared to do that. And I hope in some ways to still be able to do that. I knew I didn’t want to do another college presidency; this was the only college presidency that would ever be right for me. So I made the decision to step down, intending to determine the next step down the road, not immediately. I was contacted by the VFIC unexpectedly. I didn’t know that their president was planning to step down; that had not been publicly announced. I have enjoyed working with the other college presidents in Virginia, and I have enjoyed making the case for independent higher education. I really do believe higher education is at a critical point in its history in our society, and the VFIC presidency sounded like an intriguing opportunity to make the case for independent higher education in a state where independent higher education has played a vital role. So it was one of those decisions that just felt right at the right time, and they were kind enough to wait until April 1, 2017, to let me start. I ran out of reasons to say no. But I’m looking forward to it. I think it’ll be exciting. And I can still maintain contact with Washington and Lee. We will be living in Richmond, which is close enough to Lexington that we’re going to be back and forth a lot. It’s the best of both worlds for us. Q: What will you miss most about W&L? Boy, I could say a lot of things, but there is something about the quality of the relationships around here. Walking into Washington Hall this morning, I ran into Kathy Wallace, who is the custodian here. Kathy had been working since 2 a.m., and here I come strolling in at what is for most of us the start of the work day — 8:30 or 9 o’clock. She and I were talking downstairs for a few minutes about everything from the weather to how the summer has gone to what we’ve been up to. And just before that, I crossed paths with one of the Facilities Management workers who was out with the leaf blower cleaning off the sidewalks. You know, I just never take for granted that we are at a place where people understand that what we do matters. They take great pride in Washington and Lee and their own individual contributions to the university, and I don’t think there are many places around where that happens to the extent that it happens here. The setting in which we find ourselves contributes to the formation of that community. We are surrounded by the Blue Ridge Mountains and the Allegheny Mountains. We are in the Shenandoah Valley. We are in a town that has a lot of character itself, so that fosters highly personalized interaction. Things happen here at a certain pace. There is time for reflection and there’s time for action, but the setting in which we find ourselves contributes to that as well. People walk on the campus who are tourists, and they say, “My God, you work here every day?” And I never take that privilege for granted. It really is a special place and a special setting.